The language of the statistic implies they receive $2 a day, but in fact it is an average, and smoothing that average requires financial products. So too does paying for an emergency, saving for a wedding, and temporarily extracting cash from non-fungible assets. The language of “unbanked” implies that these people are without financial products. 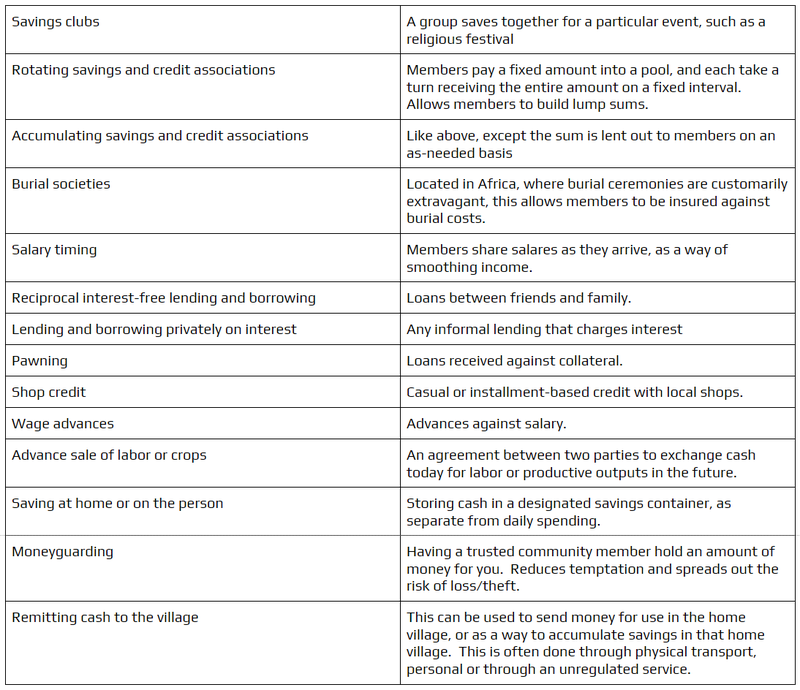 The informal financial products listed below are built on community trust, which allows for a lower transaction cost of providing service, but increases the risk. There is a Bangladeshi tradition called “musti chaul”: holding back one fistful of dry rice each time a meal is cooked to save for an unexpected visitor or a neighbor in need.¹ The listed informal financial products not only rely on, but serve to build, the bonds of trust in a community. The common narrative is lack of access, but the problem seems to be lack of relevance.¹ Account fees, minimum balances, and remittance commissions are simply unaffordable. This is far from a case of “the evil bankers.” It is merely an economic reality that there is a fixed cost for each new customer that a bank takes on. This means that the banks must recoup these costs from the customer, either though fees or through lending customer deposits. For poor customers with a low balance, this necessarily means through fees, which they cannot afford. Field trip day, organized through the government school. A stablecoin wallet would instantly provide a level of security that cash does not: inflation resistance and protection from physical theft & destruction. This is why I’m excited about Depfi, specifically the Mosendo wallet. It will hide crypto in the background and show balances in local currency. Next, MasterCard's notion of “syndicated trust” can be created with modules on top of such a wallet to supplant and supplement informal products. Because these DeFi solutions are scalable and will eventually be entirely fee-free, there is no longer a transaction cost barrier. Scalable financial products can empower even the smallest income with financial wizardry. Finally, a crypto wallet need not replace every element in the informal products listed above. For example, a shopkeeper may negotiate store credit with a customer, and collect repayment through the wallet app. It is easy to imagine how pawning, keeping savings with a friend, and interest-free borrowing and lending can all be improved with simple financial modules built on a stablecoin wallet. When cash flow is of prime importance, the poor will do things that may seem baffling: take out a loan instead of spending down savings, or choosing a higher-interest loan because the repayment schedule is better suited to cash flows.¹ Resolving these inefficiencies with customizable solutions and micro-transactions will be an immediate net benefit. Another low-hanging inefficiency: savings clubs. These popular clubs work by collecting daily wages from participants, and giving them the sum at month’s end, less one day’s fee. That’s an annual savings rate of -4%. A smart contract module could easily replace this, and furthermore could offer opportunities to earn a return on balances through DeFi lending. In my personal travels to poor regions, I am always struck by how common smartphones are even among the very poor. I like to say about the Thais that they will buy a smartphone before putting a fourth wall on their house. I had an experience last month of talking to a father in a hill tribe in Thailand who built his house out of bamboo. As he showed me the thatched roof and single room, his 7 year old daughter was sitting on the bamboo deck playing Fortnite on the family phone. The growing suite of DeFi tools is being tested by those who can survive the bugs. As they become more reliable, they will be well suited to help low earners manage their finances. It is low earners who have the most to gain by learning about and using these tools, as Andreas Antonopoulos told us at the Deconomy 2019 conference, because they suffer the most severe pain points. This means that crypto adoption will start from the ground up, where it is needed most. If what we are doing resonates with you, there are a few ways to continue this conversation and bring this vision to life. Borderless access to money and wealth, with decentralized personal finance tools. 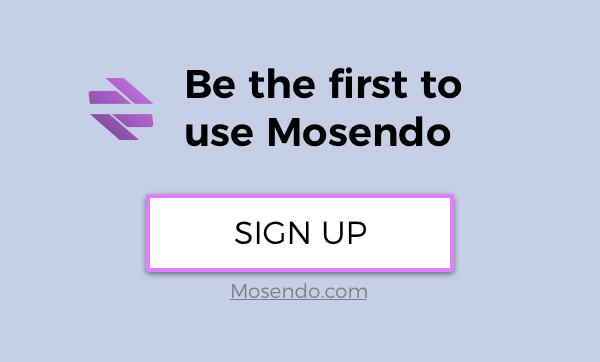 Builders of Mosendo.com — Send money to anyone, anywhere. You won’t even know it is cryptocurrency!